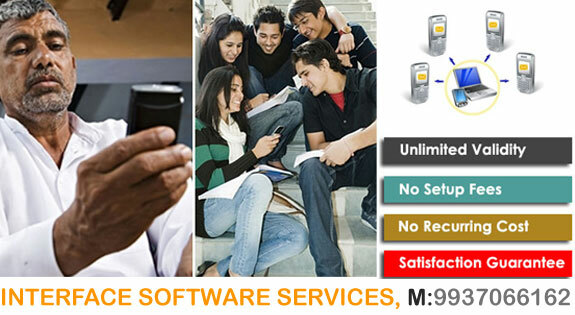 Interface Software Services is a popular name for Bulk SMS in Bhubaneswar odisha. We provide a range of customized solutions that enable entrepreneurs, businesses, non-profits, and not-for-profit organisations to communicate with their existing and potential clients. Interface Software Services is a global Bulk SMS company with a mission to help business' to reach people through mobile and the internet. Our BULK SMS solutions company bhubaneswar with over 6 years experience located in Bhubaneswar, Orissa (INDIA). We have the best facility and best interface in the Industry for BULK SMS SERVICE Partners and Resellers enabling them to sell sms at their desired pricing to beat the competition depending on quality and service. We are best bulk sms services in bhubaneswar, orissa, india. We also provide very reliable bulk SMS gateways for integration into websites, web applications, online shopping carts, banking solutions, online networking sites, share trading software, and other applications. Our online SMS tool and HTTP API are provided free of cost to our clients backed up by our excellent support team. All you pay for is for the the number of SMS credits you require which in turn depends on your needs. Our bulk sms software filters Do Not Disturb (NDNC filter - National Do Not Call Registry) numbers before sending messages. Call us to know more about the benefits and plans of Bulk sms service Bhubaneswar.